The best and cheapest way is to travel via Jordan Express Tourist Transportation (JETT) Bus. From Amman, it has a daily departure schedule of 0630H at only 9.5 JOD ($13.3) only. Travel time is around four hours. Entrance fee costs 50 JOD ($70). Schedule of departure from Petra is daily at 1600H for 9.5 JOD also. 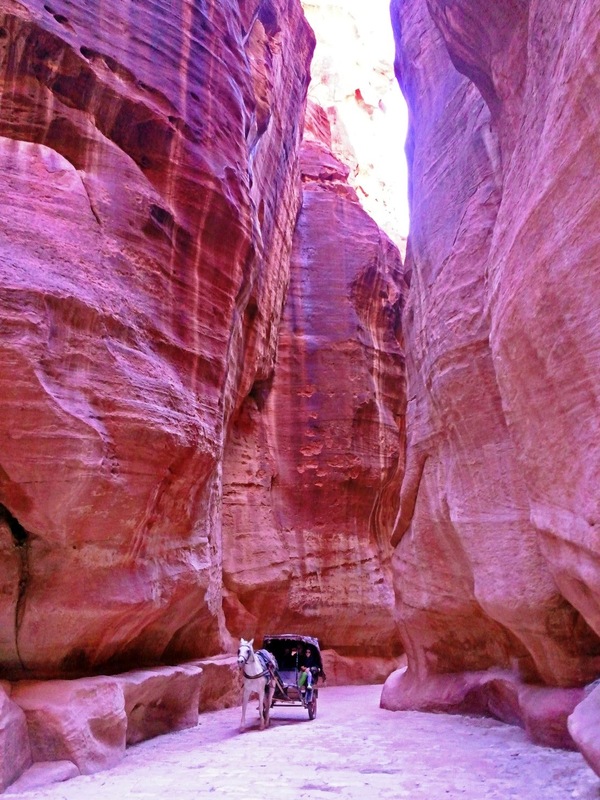 It is advisable to have 4 hours stay inside Petra to enjoy. Photography and video taking is permitted inside the park. Perhaps the words of Dean Burgon's famous poem: "match me such a marvel save in Eastern clime / a rose red city half as old as time..." reflect some truth about Petra. Some archeologists have ranked Petra as the eight wonder of the ancient world - a truly justifiable claim. Petra is unique in every respect. You do not have to be a specialist in any field to appreciate Petra because, once inside it, you will be quickly awe-struck and you will want to know the how, why and where about it. This remote dead city is one of the great archeological treasures of the world, undoubtedy; it is the most important famous attraction in Jordan. Much of Petra's appeal comes from its awesome, multicolored sandstone high mountains; it is secluded site of steep rocky slopes, towering craggy mountain top and high cliffs, into which most of the celebrated tombs, facades, theaters and stairways are carved... nature and architecture concur into conferring a mythical aura to the site. As-Siq, the Ancient main entrance to Petra. An impressive 1,200m long, deep and narrow gorge of stunning natural beauty. 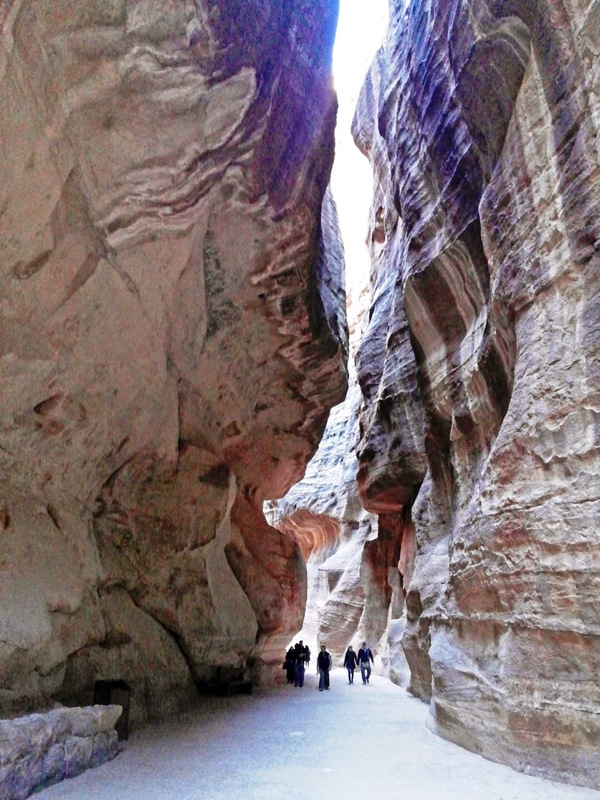 The Siq is hemmed in by cliffs soaring up to 80 meters. Suffice it to say that passing through it, one gets to see all the typical Petraean features, bizarre-looking geological formations, colorful rocks, agricultural terraces, water channels cut into cliffs and carved into rock. Just when you think you have seen enough dazzling sights in the Siq, emerging from it you suddenly come face to face with Al-Khazneh (Treasury)... the pride and joy of Petra and the most beautiful monument there. The architectural style of it was unique in the ancient world. Main inspiration was Hellenistic plus that encompassing Nabataean artistic touch. On-looking tourists usually feel dwarfed by the huge size of the facade (30m wide and 43m high). It was carved in 1st century BC as a tomb of an important Nabataean king, others say used it as a temple. Past this Treasury and adjacent to the outer Siq comes to the Street of Facades, rows of Nabataean tombs with intricate carvings. Also, The Theater looks Roman but it was executed by the Nabataeans in 1st century AD. Urn Tomb is the largest of the royal tombs, its immense courtyard and main chamber are imposing.